No-nonsense, clear strategies for using a precious resource - time! 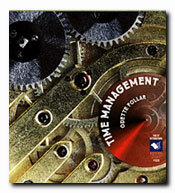 This essential collection of advice, checklists and worksheets offers a critical and eye-catching way to become more effective at time management. It covers balancing multiple priorities, managing interruptions, controlling paperwork, overcoming procrastination and many other techniques for improving productivity. Includes a special set of planning and organizing forms. Are You Ready for Delegation?